Sunkist Delite Mandarins are fresh picked from California. They’re sweet, juicy, and easy to peel; they have a flat-round shape with a deep orange, smooth glossy skin. To kick off this citrus season, Keany is featuring them as our February Fruit of the Month, although they’re available through April. Sunkist Delite Mandarins are packed with W. Murcotts, which is in the same group as the beloved clementines. The Delite brand was created by Sunkist over 20 years ago. The Mandarin Family include:s Satsuma, Clementine, W. Murcott, Royal, Gold Nugget Variety, and Honey. A good source of Vitamin C, packing a nutritious punch! They also contain iron, potassium, and calcium. 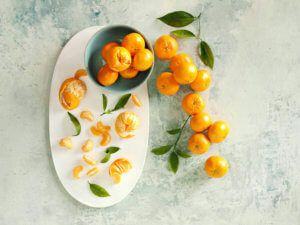 A current food trend, charring citrus takes the bright, fresh taste of Sunkist and richens it with deep, smoky flavors. Whether you simply warm it, roast it, grill it or broil it, adding heat balances sour and adds a savory note. This technique works for many varieties of citrus, so try it out with your seasonal favorites. Cut the citrus into halves, slices or wedges and place onto a hot grill or grill pan, flesh side down, until char marks appear on the fruit. No grill? No problem. Citrus can also be roasted cut-side down on a pan in a hot conventional oven. For added caramelization, dip the flesh of the citrus into a little bit of sugar before heating. For a stunning, simple plate garnish, use smaller sized lemons or limes, cut them in half and heat until char marks appear. Serve alongside fresh fish, poultry or salads for juicing over the dish. Create signature “fresh from the grill” lemonades or limeades by juicing charred citrus and serving with a simple garnish of grilled wedges or slices. Add a smoky flavor to your favorite margarita by adding grilled limes to the classic cocktail. For dessert garnishes, sprinkle citrus slices with brown sugar before grilling to add a brûléed element.